Through a $206,184 grant over three years from the Alzheimer’s Foundation of America (AFA), Stony Brook University and Stony Brook Medicine will undertake an innovative Positron Emission Tomography (PET) imaging research project that will bring new insights into the origins of Alzheimer’s disease. “Our partnership with the Alzheimer’s Foundation of America marks the beginning of a collaboration between our two institutions and it underscores our long-standing commitment to fostering scientific discovery and looking at ways new therapies can be developed,” said Stony Brook University President Samuel L. Stanley Jr., MD. Alzheimer’s disease is the sixth leading cause of death in the United States, and the only one in the top 10 without a cure or reversible treatment. Currently, more than 400,000 New Yorkers, including 50,000 Long Islanders, are living with Alzheimer’s. “This study has the potential to lead to the development of effective medications that specifically target the damaged areas of the brain and return the neurons to a state of health in people with Alzheimer’s,” said Kenneth Kaushansky, MD, Dean of the School of Medicine and Senior Vice President for the Health Sciences, Renaissance Stony Brook Medicine. Led by biomedical engineer, Christine DeLorenzo, PhD, the interdisciplinary study involves both engineering and neuroscience, and strong interactions between basic neuroscience and translational researchers in the Department of Neurobiology and Behavior of Stony Brook University and the Departments of Pharmacology and Psychiatry of Renaissance School of Medicine at Stony Brook University. The brain’s cholinergic system is unique in that it’s a network of long, very delicate neurons. It’s known that this fragile system is compromised first in Alzheimer’s disease and that it regulates memory function. As early as the 1970s, medications were developed to improve the cholinergic system to reverse the loss of memory observed in people with diseases such as Alzheimer’s. But unfortunately, as most caretakers of people with Alzheimer’s can attest, these medications are ineffective. This is likely because, without an in-depth understanding of the damage that occurs in Alzheimer’s disease, these medications don’t have specific targets to repair. It is this understanding that the Stony Brook University study will begin to provide by probing when and how this damage occurs. Stony Brook Medicine is one of the few institutions in the world that can image the cholinergic system in the living brains of both mice and people, using Positron Emission Tomography (PET). This will allow the researchers to transfer the knowledge from their careful studies done in mice with the same gene expression seen in Alzheimer’s to improve their understanding of the cholinergic system in people. Using Stony Brook Medicine’s simultaneous PET/MRI, the team of researchers will further increase their knowledge of the cholinergic system and its far-reaching effects by examining the consequences of cholinergic system changes on brain structure and function. PET and MRI imaging will occur at the same time within the same scanner, allowing the researchers to obtain a comprehensive view of people’s brains in health and disease. Principal Investigator Dr. DeLorenzo’s co-investigators for this study include Ramin Parsey, MD, PhD (Chair, Department of Psychiatry); Lorna Role, PhD (Chair, Department of Neurobiology and Behavior); David Talmage, PhD (Department of Pharmacology); Nikhil Palekar, MD (Medical Director, Stony Brook Center of Excellence for Alzheimer’s Disease); and Mala Ananth, (Neuroscience PhD candidate). 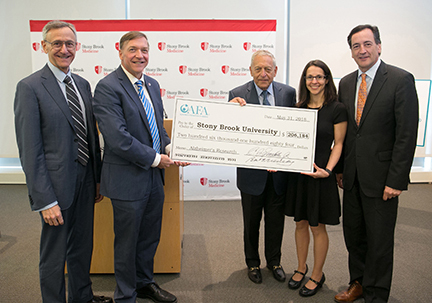 While this new AFA-funded study will help push forward the frontiers of biomedical research on Alzheimer’s in the emerging field of neurotherapeutics, Stony Brook Medicine has been a leader in the region for combating Alzheimer’s disease for over three decades at Stony Brook University Neurosciences Institute— through basic, translational and clinical research, diagnosis, treatment, as well as education. This commitment is also demonstrated by the activities and programs of the Stony Brook Center of Excellence for Alzheimer’s Disease, one of only 10 centers supported in part by a grant from the New York State Department of Health, serving Suffolk and Nassau counties.